Award winning sound: Naim Mu-so | What Hi-Fi? Three years is a long time in consumer electronics, but since the launch of the Naim Mu-so in 2014, no other wireless speaker has managed to be worthier of your £1000. There’s little this Mu-so can’t do. 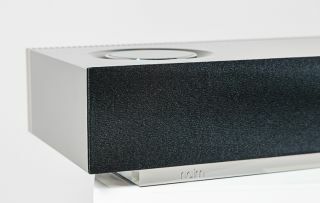 Naim has included nearly every streaming method into the mix – there’s aptX Bluetooth, Apple AirPlay, UPnP, Spotify Connect, Tidal, and internet radio all on board. The Mu-so supports all popular audio formats, from low-res MP3s and Spotify streams to 24-bit/192kHz WAV, FLAC and AIFF files. And so long as you connect via Ethernet, you can get full-fat high resolution audio. Once connected, everything can be controlled via the Naim app. The smart, sleek design extends to the Mu-so’s control dial and touchscreen interface. Tap the illuminated icons to pause or play a track, or spin the dial to select any of the three wired inputs, or switch between five preset radio stations (you can set presets using the app). Inside the smart chassis are six custom-designed drivers, 450 watts of power and Naim’s own DSP technology. And it all comes together in superlative style. The power behind the Mu-so’s sound is astonishing. It drives all songs with a sure-footed sense of rhythm, rich detail and lashings of deep, rumbling bass - something you simply won’t get from other wireless speakers. The scale of sound is huge, thanks to soaring dynamics and a wide soundfield. The Mu-so is as confident and composed with subtle details as it is with complex rhythms, thanks to a precision that permeates every track the speaker delivers. The Naim Mu-so looks as good as it sounds, and has a spec sheet that’s just as impressive. It’s more than worthy of a front-and-centre position in any room and is a comfortable winner of the award for best wireless speaker over £500.